Wondering what happened on Black Friday 2018? A lot! The peak shopping period continues to grow around the globe, and more than ever, consumer spend is spilling over into other days throughout the week. To help brands and retailers understand shopper behavior around Black Friday 2018, we took a look at daily traffic and sales from more than 2,500 retailers in 19 countries. From there, we created the Black Friday 2018 Dashboard, an interactive dashboard where you can see what happened from Wednesday November 21st through Thanksgiving, Black Friday, that weekend, and Cyber Monday. Criteo research shows that Black Friday 2018 sales clocked in at 4.87 times the average October 2018 baseline, while Cyber Monday came in at 4.77 times. Furthermore, a number of world regions saw a marked increase in retail site traffic and sales from the day before Thanksgiving all the way through Cyber Monday. 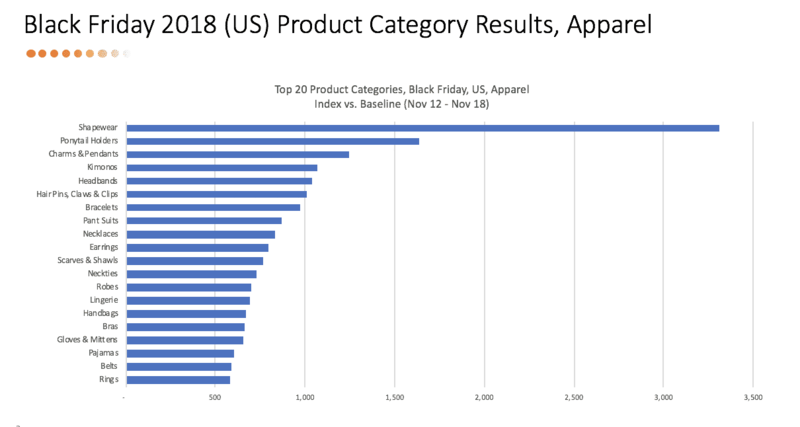 Criteo data for the US also gave us insight into what American shoppers were hunting for just after Turkey Day. 1. Consumers in the US were feeling extra stuffed after this year’s turkey dinner. In the US, shapewear and kimonos saw extreme gains and were high up on the list of most-purchased apparel products. Special-use items, like pant suits, robes, lingerie, and pajamas also did well. Skimpier basics (shorts, dresses, shirts, tops) saw below average gains. 2. American shoppers were looking to keep things au natural. Products that bring out one’s natural beauty (brushes, skin cleaners, soaps, shampoo) far outperformed categories designed to facilitate more embellished glamour (eye shadow, perfume, bronzers, mascara, eyeliner, lip gloss). 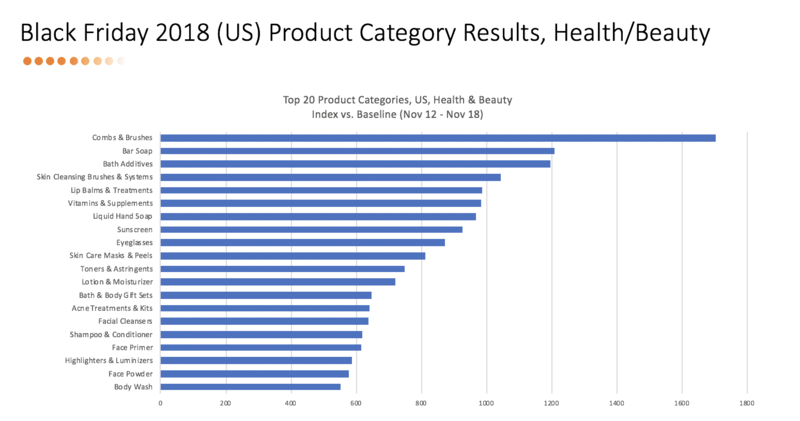 Body care products (acne treatments, vitamins, sunscreen, skin care masks) also did well. Male-use categories were not Black Friday draws, with anti-perspirant and aftershave performing poorly. 3. Europe loves Black Friday. Sales in France, Germany, the UK, and the Netherlands spiked on Black Friday 2018, and stayed strong through the weekend. As our Black Friday Momentum in Europe dashboard shows, the historically American shopping extravaganza has been growing steadily across pond for the past several years. Black Friday 2018 was no exception. Compared to the average in October, France saw retail site traffic increase by +129% and sales by +265% on Black Friday. Spend was strong through the weekend, especially Sunday when sales spiked by +211%. In Germany, sales were up by +202% on Black Friday and stayed high over the weekend, spiking again on Sunday at +105%, compared to the average in October. The Netherlands saw a giant +295% rise in retail sales on Black Friday. Sales were more than double the average in October on Saturday (+135%), Sunday (+175%), and Cyber Monday (+153%). In the UK, retail sales spiked by +292% on Black Friday. Here too, sales were over twice the average in October through Saturday(+106%), Sunday (+131%), and Monday (+140%). 4. The US and Canada love Cyber Monday. Black Friday momentum may be growing in Europe, but Cyber Monday is still definitely more of a draw in the Western Hemisphere – especially for tech-related products. No news here: Americans love a good deal, and they know when to bring one home. Retail sales saw a whopping +387% increase on Black Friday 2018, and another giant spike of +377% on Cyber Monday. Sales in the Consumer Electronics category rose by an incredible +463%. In Canada, compared to the average in October, retail sales increased by +445% on Black Friday 2018, with Cyber Monday sales at +433%. Black Friday is more than a single day of deals, it’s a week of opportunity. Global consumer spending spike isn’t just for Black Friday itself — it’s a big opportunity period that encompasses the days preceding and following Black Friday. If you’re a marketer, it’s important to start special offers early and keep them running. After all, Christmas is still a month away. Be sure your products stay top of mind. Criteo Dynamic Retargeting, for the web, apps, and social media, can help. To learn more and for all our top tips on how to win maximum holiday sales, download our report. And be sure to check out the Criteo Seasonal Sales Dashboard for insights on mobile share, site traffic, and more.